An operation in which a face mill machines a flat surface of the workpiece in order to provide a smooth finish. 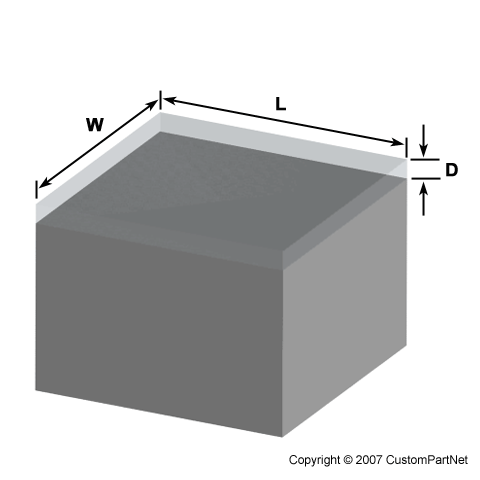 The depth of the face, typically very small, may be machined in a single pass or may be reached by machining at a smaller axial depth of cut and making multiple passes. 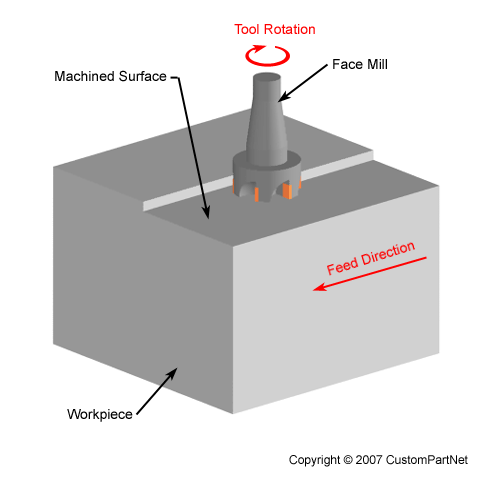 For a rough operation, the recommended cutting speed and feed for face milling are used. A finish operation will lower the cutting feed according to the finish requirements. 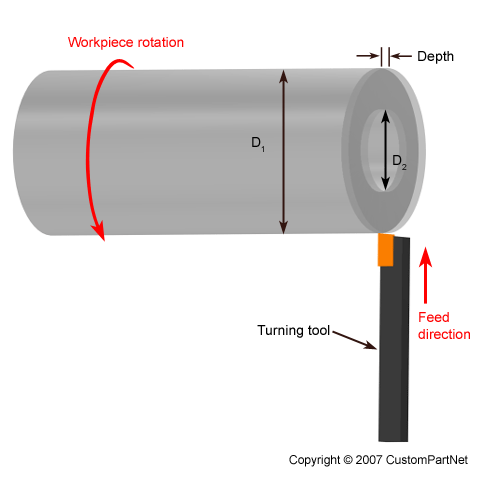 A turning operation in which a single-point tool moves radially, along the end of the workpiece, removing a thin layer of material to provide a smooth flat surface. The cutting tool moves from the outer diameter to the center or inner diameter of the workpiece or can move in the opposite direction. The depth of the face, typically very small, may be machined in a single pass or may be reached by machining at a smaller axial depth of cut and making multiple passes. For a finish operation, the cutting feed is calculated based on the desired surface roughness and the tool nose radius. The amount of material that will be removed from the end of a piece of bar stock by a facing or face milling operation, before the next workpiece is cut. 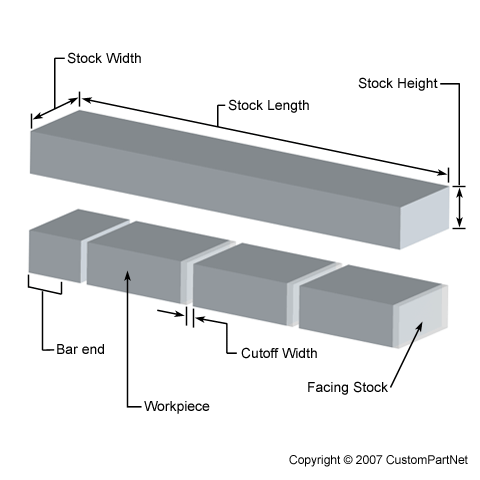 The facing stock is used in determining how many workpieces a single piece of bar stock will yield. A multiplier that is applied to a calculated force requirement to arrive at a greater amount of force that is deemed safe. 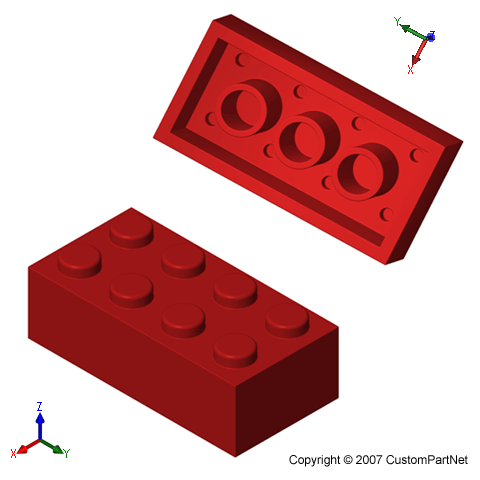 Parts whose primary function is to hold two or more parts together. 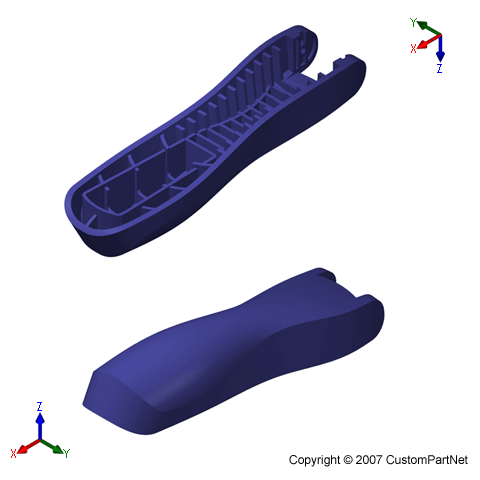 An estimate of how many features occur on a part. 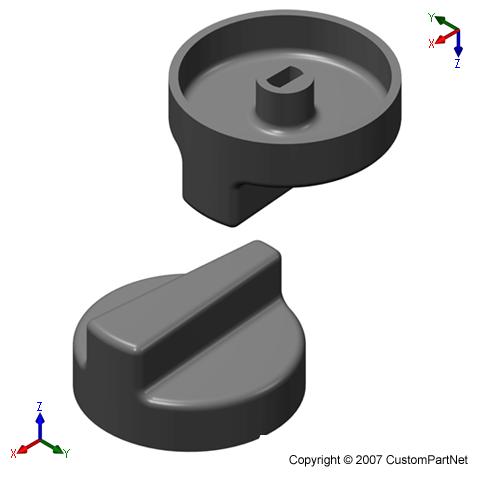 Any protrusion or depression on the main body of the part can count as a feature, including holes, slots, pockets, pins, ribs, bosses, etc. 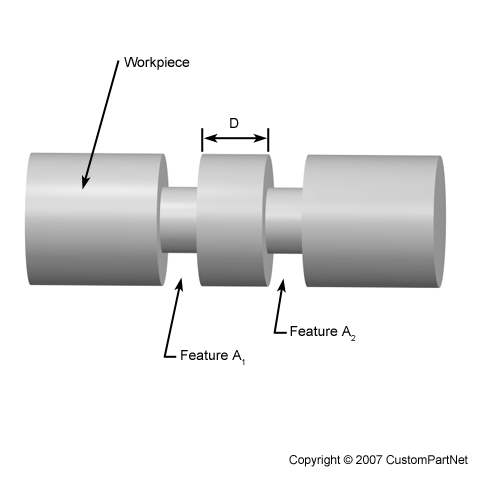 The feature count is the primary indicator of a part's complexity. The number of features with identical dimensions that are to be manufactured in the same way. The distance between two identical features, measured from the end of one feature to the start of the next. If multiple identical features exist at varied spacing, then the average distance between two neighboring features should be used. The speed of the cutting tool's movement relative to the workpiece as the tool makes a cut. 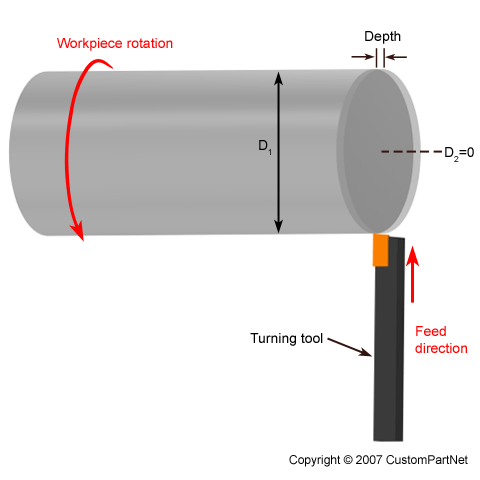 In some operations the tool feeds into the workpiece and in others the workpiece feeds into the tool. The feed rate is measured in inches per minute (IPM) and is the product of the cutting feed (IPR) and the spindle speed (RPM). 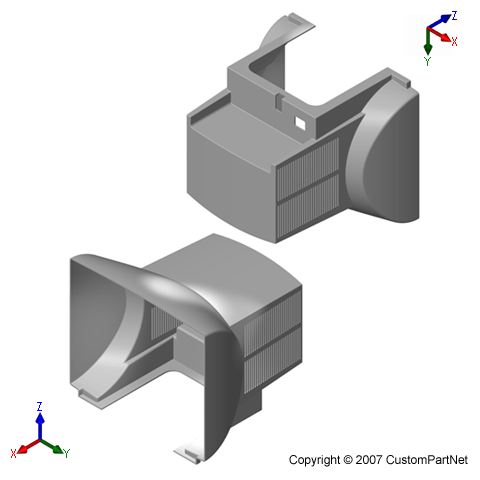 Sometimes called the runner system or gating system, the feed system describes all of the channels in a mold that allow the molten material to feed into the cavities. This system may include the pouring basin, sprue, runner, riser, gate, etc. Related to iron; derived from the Latin, ferrum. Ferrous metals are, therefore, iron-based metals. A lightweight packing material, such as foam packing peanuts, that is used to fill empty space in the box and protect the packed parts. The device used to secure the workpiece in the machine. The type of fixture selected will depend upon the workpiece size and shape, as well as the operations to be performed. 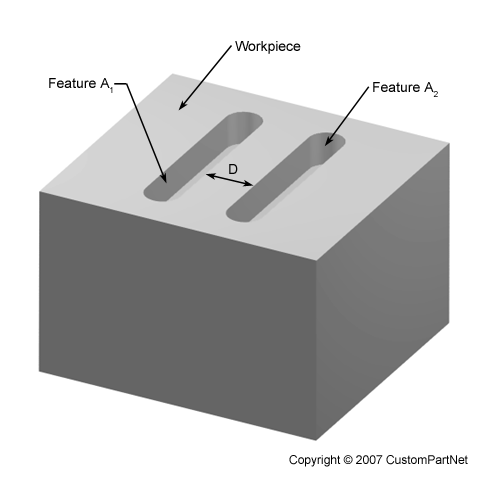 Sometimes, a custom fixture must be designed and constructed to accommodate the workpiece. Also, the fixture setup time and workpiece load time may depend on the fixture type. The time required to setup the fixture inside the machine. This time is added to the machine setup time. 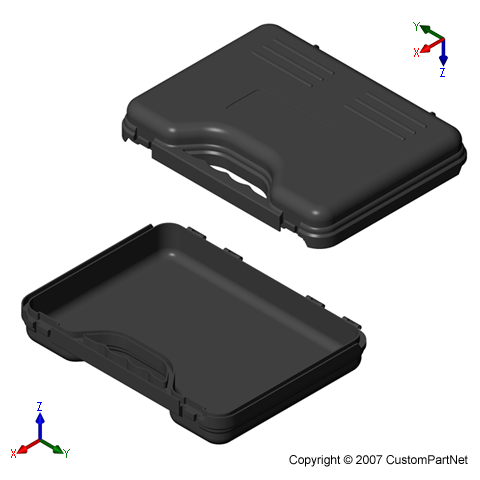 The occurrence of molten material seeping out of the mold cavity and solidifying. Once the part is ejected, a thin layer of material will have formed attached to the part along the parting line. The measure of a materials ability to withstand failure due to bending. Units of Flexural Strength are psi (English) and MPa (Metric). A groove on the side of a cutting tool, such as an end mill or drill bit, that is between the cutting teeth. These grooves may be vertical, but typically form a helix to allow the material chips to be pulled away from the workpiece. A generic term for measures of resistance to extension of a crack. The term is sometimes restricted to results of fracture mechanics tests, which are directly applicable in fracture control. However, the term commonly includes results from simple tests of notched or precracked specimens not based on fracture mechanics analysis. Results from tests of the latter type are often useful for fracture control, based on either service experience or empirical correlations with fracture mechanics tests. See also stress-intensity factor.